Taking a look at the incoming draft classes of Buffalo’s division rivals there’s a ton of new talent on the rosters of the AFC East. The Bills did a solid job of addressing some positional needs, particularly with their first three picks. Here’s a look at what Miami, New England and New York were able to pull together with their draft choices last weekend. Rd 2 – ILB Raekwon McMillan – Ohio St.
Rd 6 – DT Vincent Taylor – Oklahoma St. The Dolphins did a good job over the first two days to help their defense. Harris can be the heir apparent to 35-year old Cameron Wake. McMillan will allow Miami to move Kiko Alonso outside to reduce his wear and tear and Tankersley could compete for a top four role. Isaiah Ford is an underrated receiver who can make difficult catches in a crowd. Rd 3 – DE Derek Rivers – Youngstown St. The Patriots got an unheralded pass rusher in Rivers and a promising tackle in Garcia. I saw Garcia all week at the Senior Bowl and despite a lean athletic frame, he is naturally strong and had no problem bowing up and holding off pass rushers. The Jets secondary was clearly a focus. Size at corner was the priority even though they didn’t address the position until the end of the draft, but Clark and Jones are both over 6-2. Their passing weapon picks through the middle rounds were pretty good. Stewart and Hansen catch everything and Leggett is a gamer at tight end. After making their second trade of the day on Friday the Bills know they’ll be sitting around for a while here on day three of the NFL draft, unless some unusual opportunity to move up surfaces. Buffalo has not pick in round four and their first pick is more than halfway down the board in round five, with the selection they got from New England at 163 overall. The Bills made their second trade in as many days, this time to move up from their pick at 44th overall to pick 37th overall in a trade with the Los Angeles Rams. Buffalo acquired pick 37 and pick 149 in exchange for the Bills pick at 44 and 91 near the bottom of round three. Buffalo has three picks on day two of the draft tonight at 44, 75 and 91 overall. Head coach Sean McDermott in an appearance on the John Murphy Show explained what caliber of player they’re hoping to land with each of those three choices tonight. In a draft that’s considered deep at cornerback, safety, wide receiver and tight end, the odds of landing starting caliber talent is realistic. Head coach Sean McDermott said there was a lot of interest in their pick at 10 on Thursday. Kansas City was ultimately the team that completed a trade with Buffalo, but other teams were certainly trying to do the same. McDermott in an appearance on the John Murphy Show Friday confirmed that there were other teams calling Buffalo trying to get their pick at 10. Buffalo moved down 17 spots to 27, but was very happy with the player they got in Tre’Davious White. Bills head coach Sean McDermott told Buffalobills.com earlier in the day that there were a lot of teams interested in their pick at 10. Before they were on the clock Buffalo swung a trade with Kansas City giving up their pick at 10 in exchange for the Chiefs pick at 27, their third-round pick (91st overall) and their first-round pick in 2018. The Bills hold the 10th pick in the NFL draft tonight. We took a stab at who we think the Bills will take in round one in our mock draft. Here’s a look at the most popular positions selected by Buffalo in the first round in their history. As seen below running back is the winner in round one for the Bills, running back is the winner followed closely by cornerback and wide receiver. With the Bills acquiring an additional fifth-round pick from New England after the Patriots signed restricted free agent Mike Gillislee, Buffalo’s rookie cap will now increase to accommodate the additional player salary the Bills will inherit via the draft. Here’s a look at just how much. With some assistance from overthecap.com the Bills original rookie pool was approximately $6.33M. Now with the additional fifth-round pick from the Patriots, Buffalo’s rookie cap number will be about $6.86M, a tad more than a half million dollar increase. Here are the approximations for rookie pool monies for each of Buffalo’s current picks. Hey Bills fans, do you want to know what the experts are saying about this year’s NFL Draft? 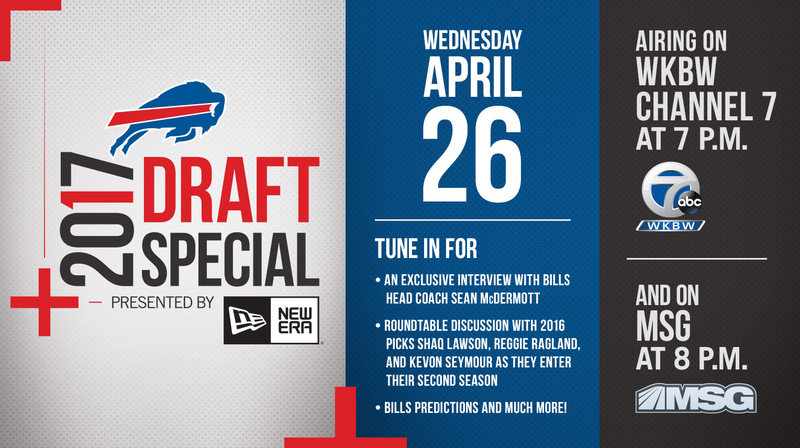 Tune in to the 2017 Bills Draft Special, presented by New Era, to find out! The special will air on Wednesday, April 26 on WKBW Channel 7 at 7 p.m. and again on MSG at 8 p.m. Throughout the show, the Radio Voice of the Bills, John Murphy, will be joined by Bills Insider Chris Brown and legend Steve Tasker to bring you expert analysis, as well as an in-depth look at Buffalo’s draft prospects. The show will feature a variety of segments including an offseason recap, an interview with Bills head coach Sean McDermott, a roundtable discussion with Bills 2016 selections Shaq Lawson, Reggie Ragland, and Kevon Seymour, insight from national media, a mock draft and much more. There has been a lot of talk the past week that the Bills have a lot of interest in North Carolina QB Mitchell Trubisky. The Browns, who are in dire need of a quarterback, but won’t take one with their top pick, reportedly have made overtures to the Jets, who have the sixth pick, to trade up from their second spot in round one at 12 to leap frog Buffalo. That according to NFL draft site, WalterFootball.com. According to their report, sources say that the Browns and Jets are talking about a trade that would have the Browns moving up from the 12th pick to the Jets’ selection at No. 6 in order to take a quarterback with Trubisky the primary target. Here’s the rest of their report. In order to move down, the Jets want the 33rd-overall pick (second round) and the selection at No. 108 (fourth round). Those are the first choices on the second and third days of the draft. Leading off those days of the draft, New York would have some highly coveted picks that could allow them to trade down again with a team that is desperate to land a player they didn’t think would make it to that spot. Cleveland is trying to trade its second-round pick, No. 52 overall, and the first selection in the fifth round, No. 145. With the sixth pick, the Browns are believed to want Trubisky. Cleveland is concerned that the Jets or the Bills (at pick 10) would take Trubisky before Cleveland is on the clock at 12. Even if Trubisky goes off the board earlier to the 49ers (2) or the Bears (3), the Browns may want to do the trade in order to land Clemson quarterback Deshaun Watson before Buffalo is on the clock. Draft day is closing in. Let’s get to your questions from email at AskChris@bills.nfl.net and on Twitter at @ChrisBrownBills. 1 – @ChrisBrownBills Could the Bills be legitimately in the hunt for Sherman? CB: I don’t see Buffalo as a realistic trade partner with the Seahawks. Here’s why. Seattle is looking to cut their payroll and get younger. Draft picks are what they are after in exchange for Sherman. With the Bills possessing just six picks in this year’s draft, which is known as a deep class with great value in rounds two through four, I can’t see the Bills parting with picks to inherit a 30-year old corner making the kind of money Buffalo themselves chose to avoid when they let Stephon Gilmore walk. CB: I’m not trying to hedge here, but I believe it’s linebacker and cornerback. They need premium athletes at both positions, which is why I think if the value is right that’s what they look to address early in the draft. Is there anything at this (admittedly very early) point to differentiate Sean McDermott from his lengthy list of unsuccessful predecessors? CB: While I think it’s easy to differentiate coach McDermott from his immediate predecessor knowing their approach to coaching is diametrically opposed, we all know that his abilities on game day as a coach are complete unknowns. No one has seen him operate as a head coach on the sideline on game day. So while there have already been several encouraging signs (assembling a proven staff, connecting with players, clear vision for the team, adding a specific kind of player talent) all people care about in the NFL are the results. And until everyone sees how he arrives at those results there’s no way to differentiate coach McDermott from those who came before him. Kyle Williams will need to be replaced soon and has been injured more often the last few years. Which draft 17 or 18 do they replace him in? CB: First, I would like to point out that with the exception of the 2015 season when he played in six games, Kyle Williams has played in 15 games or more in four of the last five seasons. That being said I do believe that depth on the interior of the defensive line is an underrated positional need for Buffalo in this draft. Unfortunately the depth on the defensive line is better on the edge than on the interior in this class. I could see them looking for a good mid-to-late round value at defensive tackle. I like UCLA’s Eddie Vanderdoes. He performed well at the Senior Bowl and could still be there in round five. That’s right where Buffalo landed Kyle Williams back in the 2006 draft. If Joe Mixon is still available late, do you think the Bills would draft him? What round would be good enough value to offset PR headache? CB: Mixon is going to be in different places on a lot of teams’ draft boards, and there will be some boards where he doesn’t appear at all. Knowing the talent that Mixon possesses I believe round four is where a lot of teams will feel comfortable selecting him. 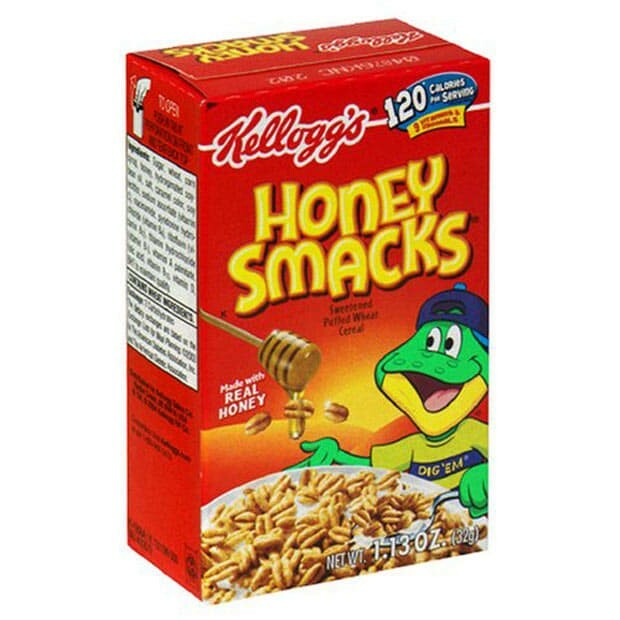 As you know Buffalo doesn’t have a fourth-round pick, so I don’t know if the Bills will ever have the opportunity to match the risk with the value. And as we’ve seen in the past there is usually one team that is willing to roll the dice and takes such a prospect a lot earlier than most anticipate. The choices for the Bills at pick 10 have ranged from QB to safety to wide receiver to linebacker. There’s been a common name associated with the Bills regarding linebacker prospects at 10 in Reuben Foster. But the latest mock draft from Rotoworld went with a different linebacker for Buffalo in round one. Rotoworld.com’s draft analyst Josh Norris went with Temple’s Haason Reddick, who has been of the biggest pre-draft risers since his monster week at the Senior Bowl in late January. Reddick proved himself capable of moving from a defensive end role at Temple to an off the ball linebacker. A solid workout at the Combine only helped boost his draft stock all the more. Here was Norris’ reasoning for his Reddick pick for Buffalo. 10. Buffalo Bills – LB Haason Reddick, Temple – Linebacker is a pivotal position in Sean McDermott’s defense, and athleticism is a critical factor for linebackers to star in the system. Neither Preston Brown or Reggie Ragland scream “range” like Luke Kuechly and Thomas Davis. Reddick offers that athleticism (93rd percentile) as well as possible blitzing or pass rushing possibilities. The Bills restructured the contract of Tyrod Taylor and will have him in the fold for the foreseeable future, but it clearly won’t preclude them from kicking the tires on some of this year’s quarterback prospects. NFL Network’s Ian Rapoport is reporting that Buffalo will hold a private workout with Texas Tech QB Pat Mahomes. According to Rapoport the workout will take place next week. The Bills are one of 18 teams to schedule either a private workout or pre-draft visit. The private workouts that have already taken place were with Arizona, Cleveland, Cincinnati, Los Angeles Chargers and New Orleans. Mahomes most recently had a pre-draft workout with the NY Jets on Sunday. The Texas Tech QB is seen as the wild card in this draft class. Though he has major mechanical flaws, his athletic talent is undeniable and that has some teams taking a much closer look.